RBI Grade B phase 1 exam consists of 200 questions for 120 minutes which valued for 200 marks. RBI Grade B phase 1 has four sections General Awareness, Reasoning Ability, Quantitative Aptitude, and English Language which consist of 80 questions, 60 questions, 30 questions, and 30 questions respectively. From this mentioned pattern it is clear that General Awareness and reasoning are going to play a really important role in your selection as these two sections alone consist of 70% of weight. So, it is suggested to read current affair properly of last 3-4 months and distribute your time wisely for this section and reasoning. Further discussing the strategy lets come to each section separately. 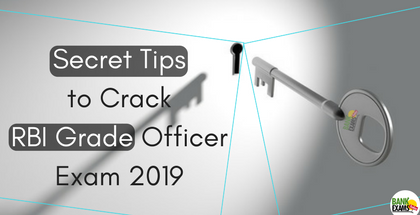 Let’s examine the section wise Preparation tips to crack RBI Grade B Officer Exam. This sections comprise of 80 questions and thus you have to focus on this section. For this section you need to be well-aware of the general issues, banking awareness and current affairs. Static GK is a major part as well. Covering the current affairs of last six moths is of utmost importance. This section will consist of 60 questions so it becomes very important to practice and attempt this section very carefully. The questions can be trick and require a practice to score the required marks. Put your emphasis on puzzles and seating arrangement because this is where the students stuck the most. Cover each and every topic ( Direction Sense, Blood Relation, Syllogism, Order and Ranking, Coding-Decoding, Machine Input-Output, Inequalities, Alpha-Numeric-Symbol Series, Data Sufficiency, and Logical Reasoning) as you will find questions from approx every topic in this section so better get ready. You need a good understanding of concepts and good speed of solving these questions which come with nothing but practice. Try to cement extensive vocabulary and practice a lot. Writing everyday on one topic will help in descritpive paper and for objective paper of Phasse attempt the easy questions like error spotting, cloze tests and parajumbles first, after doing this you will get time to solve reading comprehension. Leave time consuming questions; be careful with your choices.